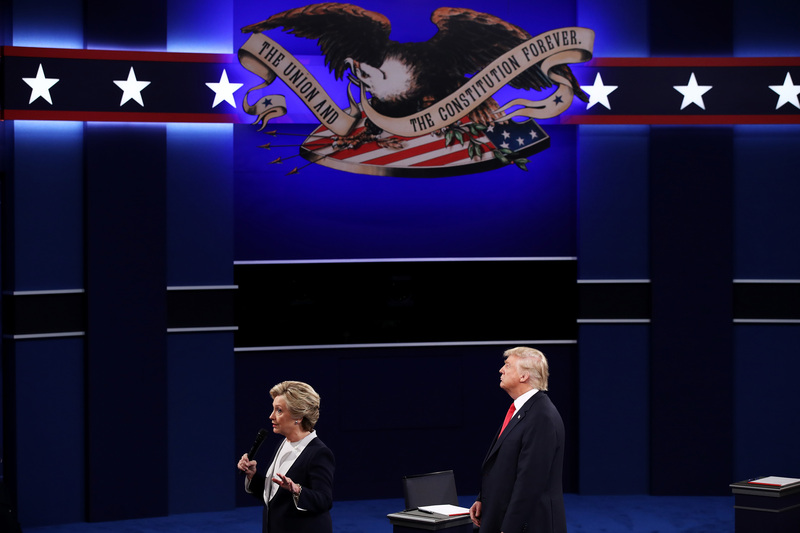 On Sunday night, America was tasked not just with attempting to sleep after the genuine nightmare of the second presidential debate itself, but with shaking off a far worse nightmare: the idea of Donald Trump standing two feet behind Hillary Clinton for nearly the entire debate. Broski not only wandered far, far away from the chair he should have been sitting his sassy self in instead of interrupting Hillary Clinton 18 times (for reference, she only interrupted him once), but stood super DUPER close behind Clinton ... and lingered. With his 6-foot-3 Doom Shadow and infinite sniffling and general disregard for the human race. Can I get a YIKES? Clinton, of course, handled this like a total pro, even though the rest of Twitter was freaking out on her behalf. Because really, Trump lingering that close to Clinton isn't just a creepy thing — it's an aggressive violation of space, especially coming from a man who only this week under fire for a leaked tape where he openly bragged about sexually assaulting women. It's an attempt to intimidate, whether consciously or unconsciously, and one more way Trump has brought a very un-political matter into a political debate. Guess what, guys? Police departments in several counties have officially told residents that they're going to stop responding to clown-related 911 calls. You know what else they probably won't respond to? 911 calls about Trump standing two feet behind you. WOMP. That Time Some Guy Sidled Up To You And Your Girlfriends At Happy Hour And Said You "Don't Seem Like Other Girls"
The truth is, you're EXACTLY like other girls. In that you don't want Donald Trump creepily standing two feet behind you. Sure, it was probably not the ~nicest~ thing in the world to send Margot Robbie a love letter accompanied by a live rat, or the cast a dead hog. But live rats and dead hogs have the funniest thing in common: neither of them have ever bragged about grabbing women's pussies!! Or stood two feet behind you in a debate. That "Sup" Text You Got On Your Phone From An Unknown Number At 3 a.m.
New phone, who dis? Not Trump standing two feet behind you (PHEWPH). This cat has been famous since 2005 for curling up to people in nursing homes just before they kick the bucket. Terrifying, right? But still somehow less terrifying, and arguably far more useful, than Trump standing two feet behind you. KIC 8462852 has caused a lot of "????" among astronomers and civilians alike for its unusual and seemingly inexplicable dimming behavior over the course of the past few years. But good news, y'all! When you're abducted, it is statistically quite likely that you will be put on a pod where you don't end up two feet in front of Trump. Will it turn all of the Olympic divers into swamp monsters over the next decade? Maybe. But at least swamp monsters stay in swamps, and not two feet behind a woman just trying to do her damn job. I still have so many questions about this that will never be answered, but my primary question is this: if we hold the next debate with the candidates using suction cups to climb Trump Tower, will Trump just creepily linger two feet to the left of Clinton? Is there a way to win?? TRY NOT-SO-SUBTLY ATTEMPTING TO INTIMIDATE A WOMAN BY VIOLATING HER SPACE WHEN WE'RE ALL PLANETARY ASHES AND SPACE GARBAGE, DONALD. Welp, see you all at debate numero three, y'all. Hopefully now that Trump isn't having all that trouble with his mic anymore, he'll remember what a damn podium is.